What is the lowest common denominator Experience your Customer Segment is looking for? Where does your Experience exceed these minimum expectations? Where does your Experience miss these minimum expectations? Which of your Key Activities drive your Experience? Which part(s) of your business model creates “hassles” for your Customer Segments? What makes it hard for your Customer Segments to find you? How do your Customer Segments feel about you? How easy is it for your Customer Segments to work with you? What keeps your Customer Segments from recommending your Value Proposition? What keeps your Buyers from shifting some or all of their business to another? Where are there hassles that keep Buyers from buying your Value Proposition? Where are there hassles that keep Users from using your Value Proposition? Where does your Value Proposition waste your Customer Segment’s time? Where does your Value Proposition require extra or unnecessary steps? 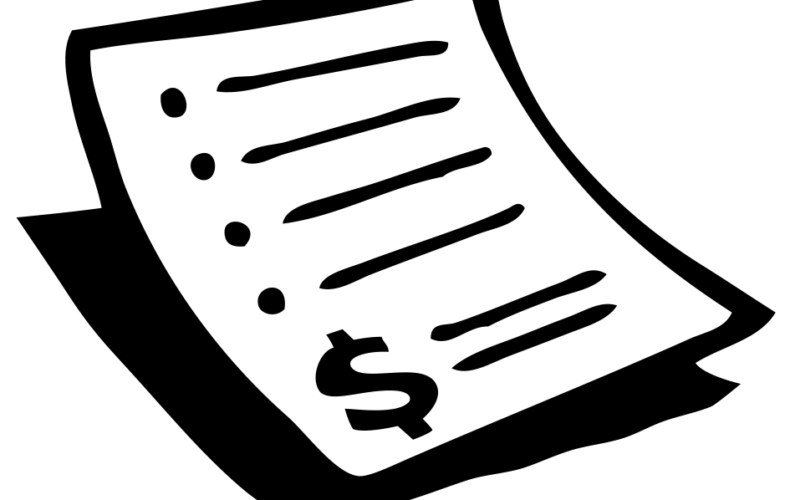 Where does your Value Proposition waste your Customer Segment’s money? Where does your business model create confusion for your Customer Segments? Where does your business model generate avoidable risks? 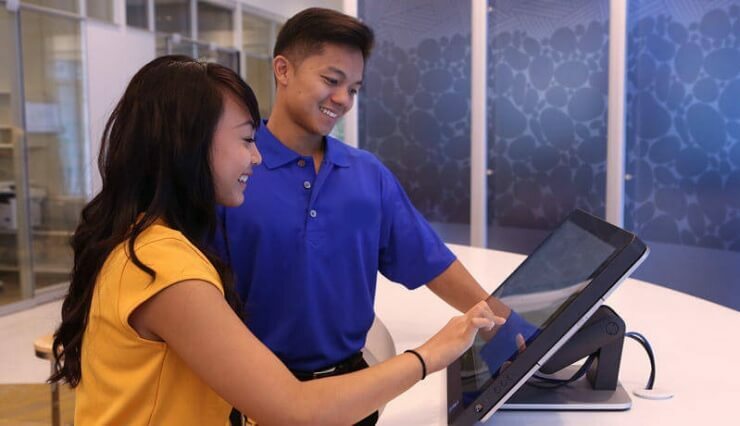 How Do You Build Your Customer Experience? 3) Helps the business block owners implement changes across the organization. 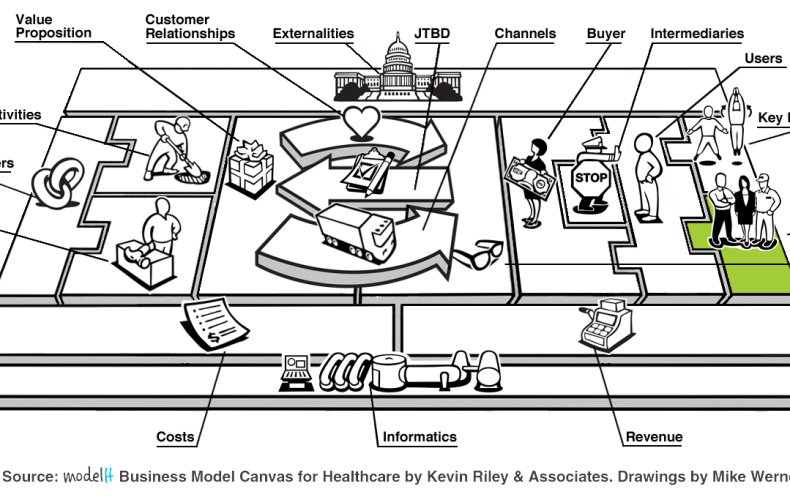 Even if your business is just a cog in a value chain, and/or you have no direct access to healthcare consumers – you must remember Porter’s sense of shared value. 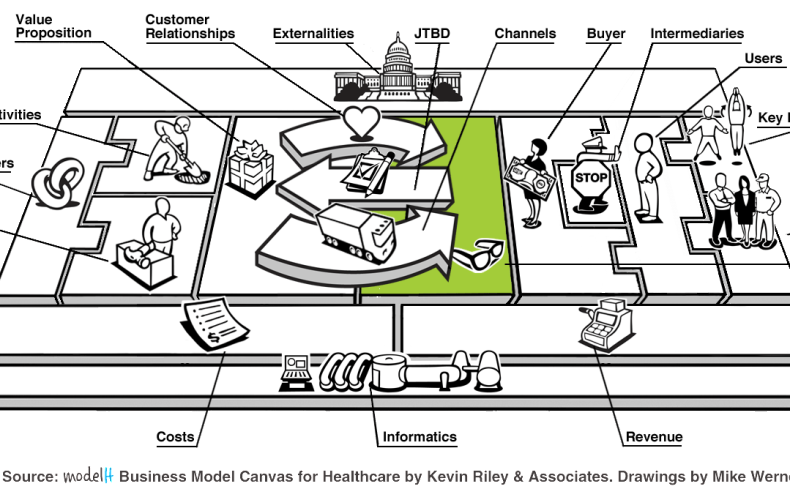 In the healthcare ecosystem, all business models have an impact on the User – good or bad. You should know how your Value Proposition plays out in this larger picture, and help to build your own Experience building block to ensure it is a good one. Fred Weirsema in his book How to Design a Great Experience highlights questions (listed below) for determining whether your business model (and the way you approach the market) is “in tune” with the customers you are trying to touch or impact (what Weirsema calls a Design Rule – the things a company must do to ensure it is attuned with its customers). Can my customer find me? What is the top-level decision frame? Does my company come up at the top of that list? How does my company make sure our name appears at the top of the list? Can they find my company through the channel they prefer? Can they discover my company thru several channels? Are SEO and SEM efforts effectively managed – to match keywords? What is the bounce or abandonment rate? 2. When they find my company – is it unique? Is the impression memorable? How do they find their JTBD? Does that tie into my company’s uniqueness? Does my company build with eye to new customer and what barriers they perceive? Is the customer’s instant judgment positive about my company’s products and services? Is my company’s website clear, reassuring and confident? Does the website remove barriers? 3. 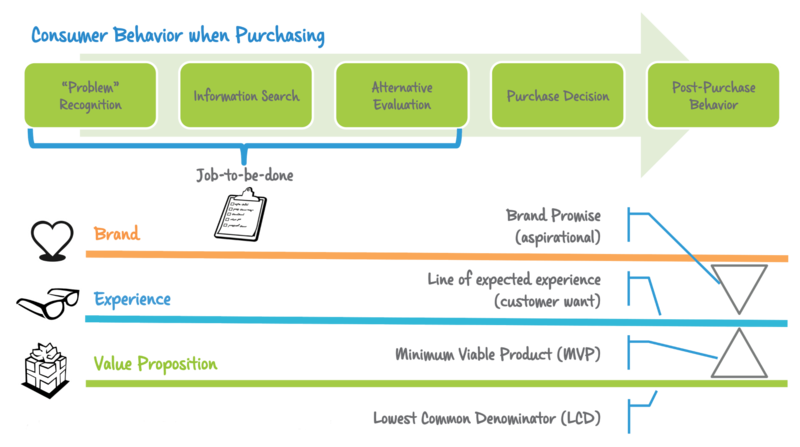 Do your company’s processes get in the way of a purchase? What is the abandonment rate online? Does your company make it hard to buy or do you bait and switch? 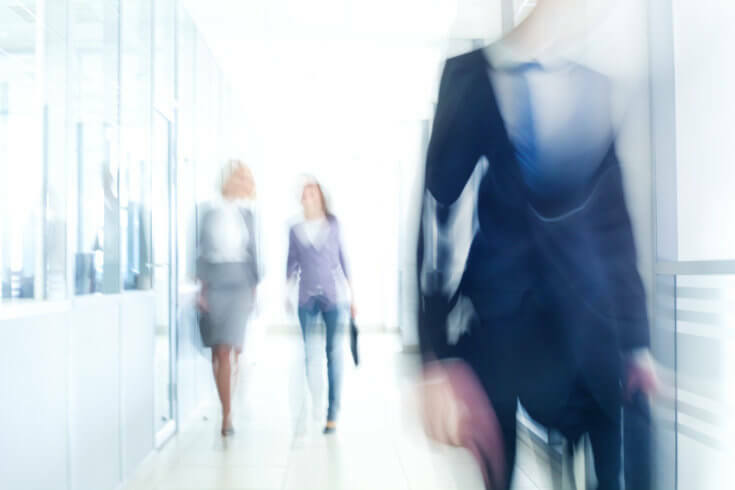 Has your company gone through a buy process step by step (exactly as the customer would) – and is it smooth and predictable or is it jolting? 4. Does your company send unintended messages? Is the boilerplate type of message giving off a legalese gotcha moment? Has your company considered how its actions will be perceived? 5. Are your company’s products and services intuitive? Do customers need an instruction manual to navigate your company’s processes? Does your company build on the Minimal Viable Product (MVP)? Do your company’s processes, products and services keep with what is expected? Have you avoided unwanted advanced, or too many, options? 6. Does your company’s approach to the market have threaded channels? Is “same customer – same data” readily and consistently available? Are your company’s messages and behaviors synchronized? Does your company’s treatment and approach stem from your unique brand promise? It seems plausible that you should identify and know your Customer Segments before you create products and services for them. Likewise, once you have products and services tailored especially for them – you create winning Experiences for them through the various Channels and Customer Relationships. The flow can be seen visually here. Customer Segment Development – know your customers, (who they are, and what they want) and most importantly learn their values. Value Proposition Management – create value that your customers perceive because it effectively solves their jobs-to-be-done. Customer Experience Management – know how your customers want to experience your products and services and create favorable engagements for them as they discover, consider, buy and use them. A measure indicating how well Consumer Experience is embedded into the corporate strategy. A measure indicating how much Consumer Experience is emphasized as a critical area by all employees/internal stakeholders. A measure indicating the alignment of Consumer Experience with your company’s brand promise. A measure indicating the development of the roles that lead and drive continuous improvement for the Consumer Experience function. 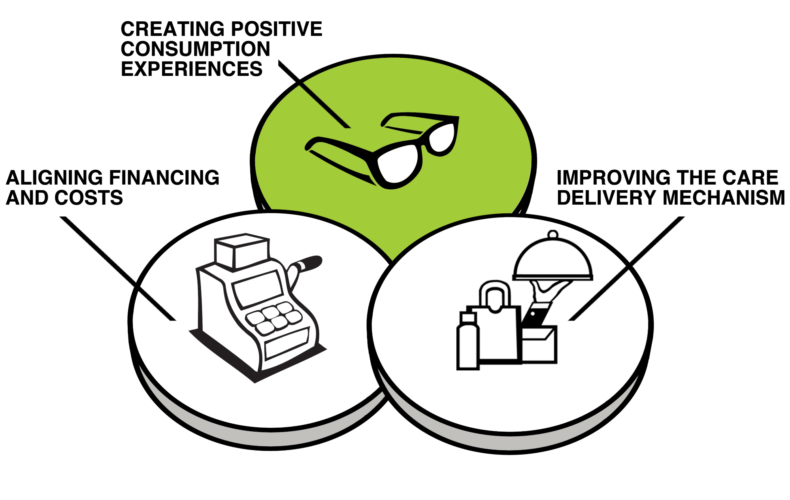 A measure indicating the clarity and utilization of the Customer Experience process. How easy is it for customers to find you? How easy is it for customers to stay with you? Next up, we are going to look at Project 1.11, 12, and 13 – Key Activities, Resources, and Partners. Interested in what we are doing? Step up to the plate an get involved. So we are modifying the canvas image itself to have 3 parts within the Customer Segment block. an Intermediary (the person who filters, persuades, and affects User healthcare decisions). When the User and Buyer are not the same, and they almost never are in healthcare, it splits elements of the business model into two (or more) paths. As an example, one User and one Buyer create two Relationships, two distribution strategies (Channels), two Value Propositions, etc. We feel that our health model canvas in both form and function must enable practitioners to account for 1) the overall value created and 2) multiple paths to get there. So, along with the revised image, we are applying the following rules to the Customer Segment block. Users should always be considered an individual (consumer). Buyers can be the user, a business or a government. Users and Buyers have different driving motivations and thus different Value Propositions. Intermediaries act in conflict or benefit between the Value Proposition, Buyer, and the User. This looks at segmenting by different Archetype categories of people based on their needs, attitudes, and behaviors to healthcare decisions. Some of the defining elements are health behaviors and attitudes, the perceived control over health now and in the future, and individual preferences for seeking and receiving healthcare information. There are some excellent commercial models available. This looks at segmenting by the different health concerns that can affect us all as we age and seek to understand and assess our health status, and navigate a complicated and fragmented health marketplace. The “status” of health becomes more relevant to consumers once they have been diagnosed, so this model looks at both pre and post awareness of, and management of, a consumer’s health conditions. Life Conditions include segments such as high blood pressure, cholesterol, diabetes, etc. In fact, Life Conditions are a actually better market indicator for how healthcare consumers will act rather than age. As an example, let’s compare music preferences. Seniors and 30 year olds rarely like the same music (unless it is Bruce Springsteen!) However, a 30 year old diabetic acts pretty much the same as a 65 year old diabetic. And correspondingly, a 65 year old “health nut” acts much closer to a 35 year old “health nut” than a 65 year old diabetic. This looks at segmenting by the major milestones each consumer reaches in life, such as birth, adolescence, young adulthood, adulthood, retirement, etc. With each of these Life Stages come significant healthcare decisions and the jobs-to-done associated within them. For example, the Life Stage for Becoming a Parent may involve the need to tackle multiple jobs-to-be-done such as getting pregnant, child birth, preparing the home environment, etc. action. These milestones make for a natural way to define targeted value propositions. For example, seniors have very different healthcare needs than young adults who are starting a family. In fact, the three highest cost milestones in each person’s life are usually their early childhood (including birth), followed by when they have their own child, and then when they enter retirement through death. This approach is one that I developed nearly 4 years ago when I built a consumer health-focused ecommerce company called GuideWell. 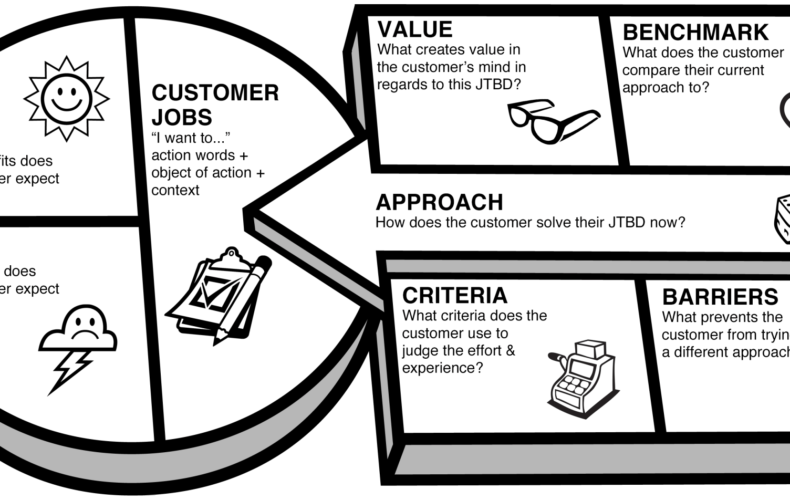 We decided to approach to a segmentation format based on Clayton Christianson’s concept of consumer jobs-to-be-done (JTBD). This is a non-traditional approach. Traditional segmentation puts a consumer into a single segment ‘bucket’. We realize that people are multi-faceted and segmenting them singularly leads to improper product market fit. The problem lies in making an educated guess on the consumer’s JTBD. This works well when your business model’s value proposition is designed to bring a tailored set of goods to the consumer from everything that is available, but narrowed down based on their specific JTBDs. We also defined the questions that should be added to our business model canvas for helping practitioners define their customer segments. What are the Questions that should be answered when developing Customer Segments for a healthcare business model? What type of market is this business model: Mass Market, Niche Market, Segmented, Diversified, Multi-sided Platform? Is the User of our product, or its derivative, also the Buyer of the product? What is the relationship between the Buyer and the User? What nomenclature does the market use to define the User in this business model: Patient, Provider, Member, Insurers, Other? How do you define a lead (for your Buyers)? How do you define a customer (for your Buyers)? What model will be used to distinguish between various User types (customer segments): Archetype (Behaviors), Life Condition (Health Status), Life Style (Job-to-be-done), Life Stage (Demographics)? What is the total addressable market size (TAM), or the revenue opportunity available for the value proposition? 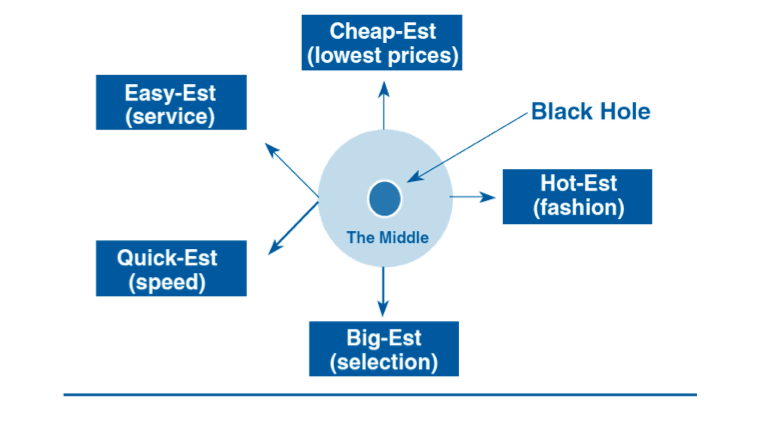 What is the serviceable addressable market size (SAM), or the customers that can be reached out of the total addressable market (TAM)? What is the target market size (TM), or the size of the initial focus for your minimum viable product release of your value proposition? Next up we are going to look at the Intermediaries who filter, persuade, and affect User healthcare decisions.